Tight End - Who Do You Want to Play Like? Who Do You Want to Play Like? What DOES IT TAKE TO BE a tight end? 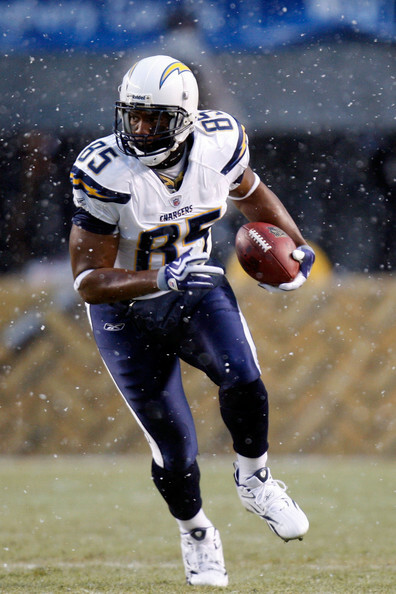 A tight end is a hybrid position player who must excel at blocking and catching. The typical tight end is strong with large hands and a high vertical jump. These skills are crucial for the one player who must know how to run, receive, and block effectively to help his team get the win. 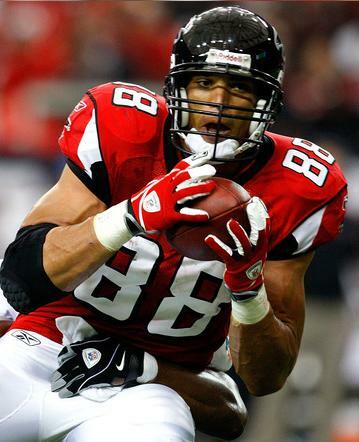 Tony Gonzalez is the definition of a textbook tight end. Gronkowski uses his hands to catch the ball rather than catching the ball with his body. He uses his athleticism to outrun and jump small defensive players, instead of running clean routes to get open. He uses his very long arms to get separation and to gain control of the defensive lineman's movement. 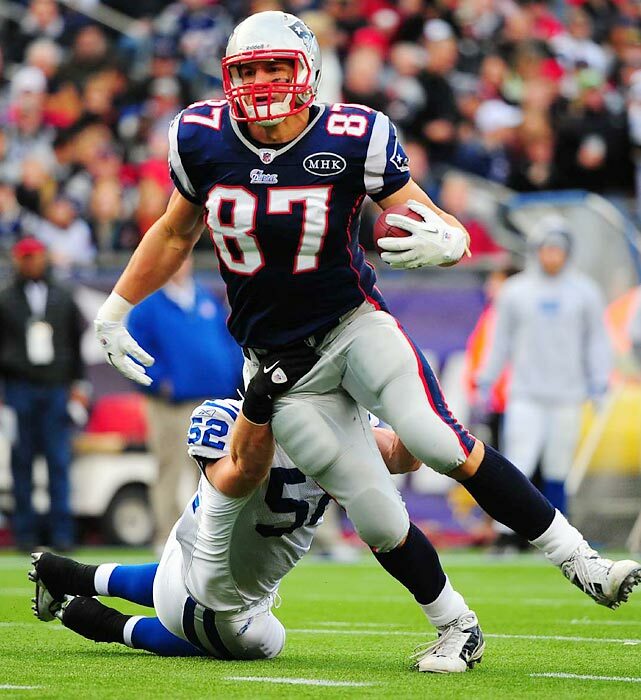 By gaining leverage Gronkowski gains control of the defender's momentum, allowing him to have control over the player's direction. Catch the ball with your palms and fingers spread open, creating a basket, allowing the ball to fall into your hands. This is much more effective than trying to catch the ball by squeezing it between your hands. Catching the ball with your hands allows you to have total control over the ball, where catching the ball with your body does not. Run the designated routes exactly as they are mapped. This is achieved by not rounding the corners or turning too soon or too late. This helps you get open effectively, and allows the quarterback to know exactly where you will be at what time. Separation is gained by using arm length to keep the opposing player from gripping the body or shoulder pads. Separation allows you to maintain control of the defender's movement. Leverage is achieved through the use of a your arms and hands. Leverage is obtained when you place your hands underneath the defender's shoulder pads and push upward. This forces the defender back on his heels, causing him to lose all momentum and acceleration. Jimmy Graham is among the best receiving tight ends in the NFL today. A former basketball star, Graham uses his long arms, large hands, and high jumping ability to catch the ball very well. He uses his body to shield the ball from defenders, while also positioning himself to make the catch. He uses his hands when catching, rather than his body, ensuring he makes the catch instead of risking a dropped pass. He fails to get leverage on defenders, leading to him losing control. When he loses control, the defender's force can drive Graham backwards. He uses his long arms to get separation, but his lack of strength prevents him from maintaining it for long. This is done by positioning your body between the defender and the ball, ensuring the defender cannot either intercept nor deflect the ball. One of the best pass catchers of all time, Gonzalez is an incredible receiver. He uses great route running and head-fakes to get open. He uses his body to get between the defender and the ball, making the defender's job harder. Gonzalez always catches the ball with both hands to make sure he has full possession of it. Gonzalez uses his explosion to gain momentum when blocking. He accelerates quickly, allowing him to deliver the hit, rather than be hit first. His quick first step allows him to gain leverage on the defensive player. Gonzalez's ability to be the hit deliverer allows him to gain control of the defender's momentum. Head-fakes are designed to trick the defender into thinking the you are going one way when you are actually going the other. Head-fakes are performed by turning the head in one direction very quickly. By a quick turn of the neck, you can trick the defender to freeze him momentarily, allowing you to turn back to your original direction to quickly catch the ball. Full possession is gained when you have total control of the ball. You gain full possession by catching the ball in your hands, then pulling the ball into your body (arms/chest area) securely. Explosion is a key component in every position of football, but especially when blocking. Explosion is achieved by forcing your body forward with all of your leg strength. Explosion help you gain acceleration and momentum very quickly, allowing you to deliver a powerful hit to your opponent. Gates is a decent blocker who can block average defensive players effectively. However, he struggles when blocking quicker defensive lineman. He relies on his lower body strength as an anchor, which is effective when used properly. Gates' short arms force him to get close to the defensive players while blocking, so the defensive player is usually the one delivering the initial hit. Catching the ball with your body is done by letting the ball pass your hands and hit you in the chest, then squeezing it to your body. This isn't the ideal way to catch the football, but it can work if you have enough strength to squeeze the ball securely. You can do this by chopping your feet quickly, which allows you to go any direction very quickly. You can perform a stutter step one direction, and quickly change back to your intended route. This is effective in the same way a head-fake is used. Plant your feet firmly in the ground, and lean your body forward toward the defender. This requires strong legs, but can make you an immovable obstacle for the defense. By leaning forward and holding your feet firm, you will position your body in a way that the defense cannot push you backward. Place your hands inside the defender's arms, around the outside of his chest plate, and pull the defender in close to you. This allows you to hold the defender close, making it hard for him to get away. Be careful with this, as it may lead to holding penalties if not done the right way.